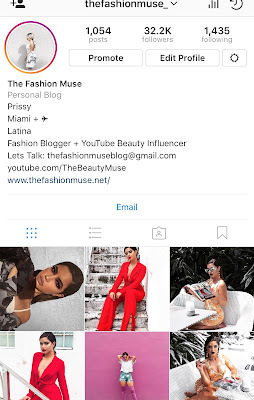 This isn't necessarily only for bloggers or influencers, I have come across so many visually pleasing Instagram pages in the past from people who are just regular IG users. It's taken me about two years or so to really figure out what direction I wanted to take my Instagram page in, and it definitely has helped having my own branding photographer on my team to guide me along the way. So, I wanted to share my tips, tricks, and apps that work for me on the regular with you all! OH, and you may or may not have noticed that I recently added a bright color onto my feed.......I KNOW, that actually took a lot of gut and planning. When planning a cohesive feed, knowing your color scheme is very important. 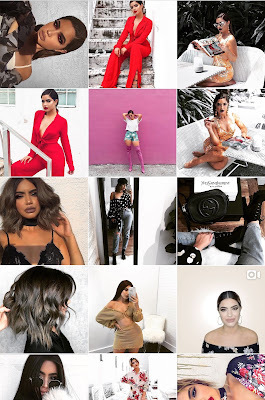 For example, my feed is made up of: white, black, grey, and pink - these are the colors I always gravitate towards the most. The best way to think of it is, think of a color palette. Just like a color palette coincides, so should your Instagram. A little trick that always works is to best keep in mind that the 1rst and 3rd photo in the row should always match up. Matching your 1rst and 3rd photo isn't always about matching in content, but matching in color scheme. Oh the magic of editing.....It'll make all the difference! As seen, a lot of my photos on my feed usually have a grey hue or a white one. On my page, I like everything to be cool tones as mentioned above (even when I result to bright colors, they have to be colors that have a blue undertone - other wise I will go ahead and edit it's original color before posting). There are certain apps that are my holy grail when it comes to editing the color in photos. Below, you can find a before and after of a recent photo I posted onto my feed. As you can see, my before photo has a warm toned (yellow hue) background. It happened to be a wall in my back terrace of my home - but the natural lighting was great, so I just HAD TO. After all, everything is always adjusted to your liking with the power of editing. One of my favorite iPhone apps to use for instances like this, is Color Pop. Color Pop gives you the ability to grey out your surroundings. It makes such a huge difference! My photographer does such an amazing job at editing and really going for shooting locations she knows I would like, but locations would never perfectly match your aesthetic. For these photos, when she sent over the edits, I went ahead and selected my favorites and added my last edit to them for Instagram. With time, I have found little tricks that work....For example, I really wanted a white hue to these photos since there was so much bright landscape going on. I used the app Face Tune to adjust the color. With the whitening tool on Face Tune you would usually use to whiten teeth with, I went ahead whitened my surroundings instead. Once my photo was ready to upload onto my Instagram, I applied the Ludwig filter. Funny enough, a lot (if not most) of my photos have this specific Instagram filter on them. (TIP: On the Ludwig filter I like to lower the temperature on its scale to the cool tone blues and play with the shadows and highlights - all on IG!). As for adding colors onto my feed, like I mentioned above I like to work with colors that have blue undertones. Whatever type of red I wear or photograph has to have a blue undertone and the same goes for bright pinks. Bright colored photos can also make for great transitioning photos if you're looking to transition your aesthetic to a more colorful one. I believe the most important aspect to having a cohesive Instagram feed is planning. Without the planning of photo placement and photo timing, there would be no cohesiveness. You essentially want to plan photos that make sense with each other. I recently went on a summer beach vacation and posted the photos above onto my feed. The middle photo of the leafs and palms was what I like to call a "fill in". Fill in photos are pictures you would post to make the whole scheme make sense. Since my first and third photo had black, leafs, and white I went ahead and made my fill in photo quite similar in editing and in content. I really hope these tips and tricks helped in some way! I have worked really long and hard to figure this whole Instagram aesthetic science out for myself. After all, sometimes it's so frustrating to build up that it could really be called a science!! There's always madness behind every planned Instagram theme.